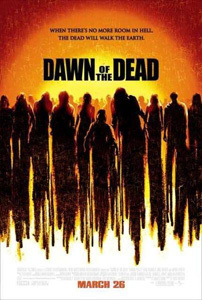 This remake of the 1978 Romero classic Dawn of the Dead is a very different movie which dispenses with social comment and slowly built tension in favour of fast-paced action and quick scares. Romero's slow paced zombies are replaced by fast and furious, feral zombies. An excellent opening scene leads to a group of survivors at the mall desperately fighting off the hordes. More action than horror this is still entertaining though it would have been better as a new film rather than a remake.